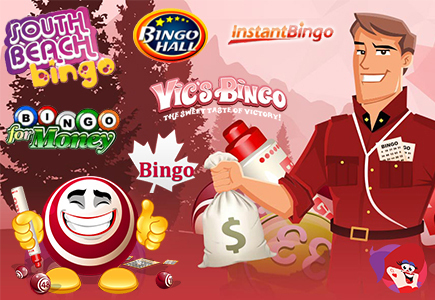 In an effort to give our members a closer look at some of your favorite bingo brands, we were able to score an interview with LBB Site of the Month Bingo Hall and sister sites Bingo for Money, Bingo Canada, Instant Bingo, South Beach Bingo and Vic's Bingo. Each of these brands are US friendly and also welcome players from many other parts of the world. They were willing to discuss everything from the largest jackpot ever won, withdrawal limits, their items in the LCB Shop and so much more. 1. What are the differences between each of the online bingo brands? Although the bingo game itself follows the same principles on every platform, the player's experience is different on each website. People don't come to our bingo rooms just to try their luck with the game. With Bingo Hall, they get a complete, multilevel interaction: they socialize, they make friends, they share tips, they communicate with our chat moderators, and, equally important for them, they get to use an absolutely user-friendly platform. All these make a huge difference. It's like comparing a game of soccer in the school yard with a derby on an international stadiumâ€¦ What's more, and probably one of the main reasons why millions of people join Bingo Hall every year, is the transparency of the platform. Another point of differentiation is, of course, the visual identity; each brand has its own dedicated environment and unique touch & feel. For example, at Bingo Hall you will be accompanied by a blue theme, while Vic's Bingo will charm you with a pink interface. We welcome players in all our bingo rooms and invite them to try them all out to discover which one suits them best. 2. Are players allowed to have separate accounts at each site? Yes. Players are allowed to have separate accounts at each site. 3. Which market do the majority of your players come from? We welcome players from all around the world. And that's what makes the game even more enjoyable. It's always a pleasant surprise to interact with people from different cultures. And our players appreciate that, it's one of the reasons they come back - always a fresh environment. Imagine there are not many places where you can have at the same table people from USA, Australia, Canada, New Zealand, Germany, South Africa and, even, India. But that's always the case in our bingo rooms. 4. What do you say to anyone who believes bingo is geared toward an older crowd and what have you done to appeal to a wider demographic? That's like stating Santa Clause should only bring presents to kids. Joy, expectation, surprise are not the appanage of a certain demographic. Everyone, regardless of his/her age, is entitled to have some fun. And we are all looking for it in all that we do, aren't we? Bingo is a handy option for everybody, because it's a fun and entertaining way to spend your time; it brings big winnings for players and we have taken all actions to make it more appealing for younger people as well. Our Bingo rooms are colorful and catchy, players are accompanied by the most helpful and kind chat moderators and games happen in real time and at a really fast pace. Even more, we work on improving our interfaces and user experience on a daily basis and we have developed mobile applications to stay relevant on today's market and have contact with younger audiences as well. As a matter of fact we aim to continue our website and mobile applications development on a constant basis to keep being one of the best Bingo providers on the market. 5. What is the average card price on each site? The average card price on each site is $0.87. 6. Tell us about your top promotions and what seems to be most attractive to players? We organize a large variety of promotions: daily offers, monthly offers, daily giveaways, bingo weeklies, slots weeklies, and even charity events where players can win bonuses, cash prizes, trips around the world to luxurious destinations, technology prizes, and more. What seems to attract players to our promotions is the variety of winnings and the constant emphasis we put on delivering to them more great tournaments where they can have fun and win big at the same time. 7. Of all six brands, what was the largest jackpot won? The largest jackpot won was $200,745.00 in the Dollar Room Jackpot and it went to kickitup1. 8. Withdrawal limits are based on the member's VIP level. What can you say to players who may be discouraged by this? It's true that the higher a player climbs on the VIP level, the bigger the withdrawal limit. There is no need to be discouraged though, as a Basic VIP player gets a $500 withdrawal limit and the number of stars accumulated increase as the player starts his online bingo experience with us and so will the VIP level. 9. How do you feel about Bingo Hall, Bingo for Money and Vic's Bingo being the first bingo brands to appear in the LCB Shop? We take great pride to being the first brands to appear in the LCB Shop as it consolidates our status of being top leading brands and sustains our image on the market. We were happy to be part of the LCB Shop and we will continue our awesome partnership with LCB. 10. What message do you think is most important to get across to players? We would like to let players know that we are continuously working on assuring the best in online bingo platforms. We want customers to enjoy their time on our sites and come back. This is the only way we can achieve a sustainable business and we do this by creating a fun, safe environment. For the current year, we have set in place priorities for future investment which emphasize the focus on creative distinctive brands with gaming responsibility and high standards for mobile platforms. Each day we are improving our website, mobile platforms, gaming interfaces, but also on the services we offer, from safe and secure banking to Live Chat support or chat moderators who assure that bingo games are taking place accordingly. And all our actions are taken for our players whom we aim to keep satisfied at all times. We also put a great emphasis in offering a great and fun bingo and online gaming experience, and we are available 24/7 for our players who always come first. That shows also in our Responsible Gaming policy which we have developed to make sure our players stay away from a possible gaming addiction. Therefore, we invite all bingo players out there to join our brands and have the best online bingo experience ever. Really great review thank you . I love instant bingo and Vic's are my 2 favorite places to play at. Good read! I like playing on Bingo Hall and I think it's nice to have a bit of insight :) Keep it up! Over $200k wow. One of our members needs to break this record! I have always been impressed by the cool promotional offers they run. Great interview! nice interview. I think these guys are rock solid. My favorite bingo sites. Great interview. I have all family sites activated ftom Bingo hall then the rest of course soutchbeach vics bingo for money instant canada also.But in practice is better just keep it one always deposited cause only in the begin when I get 2016% by first 3 deposites was very clever. Later I just get complicated cause system see my accoubts like multiple sometimes and dont want reward me etc..